While the clock is ticking on the court-required submission of Encinitas’ next housing plan, last week the City Council was hit with some strong new requirements from the California Department of Housing and Community Development (HCD). Now that a court has said that the state must certify our housing plan before we submit it, HCD has become much more aggressive in its stipulations. I think this is probably because HCD was once willing to let some things slide that they didn’t like about our plan in order to let the city craft something that was most likely to pass with the voters. But after the voters rejected our second housing plan, the state felt emboldened to require more from the city. The most consequential demand from the state is that we “amend or invalidate Proposition A” when it comes to state-required housing plans. So before we decide our city’s next move, we’ve asked our attorneys to work with HCD to understand exactly what the state would accept to comply with this “amend or invalidate” requirement. 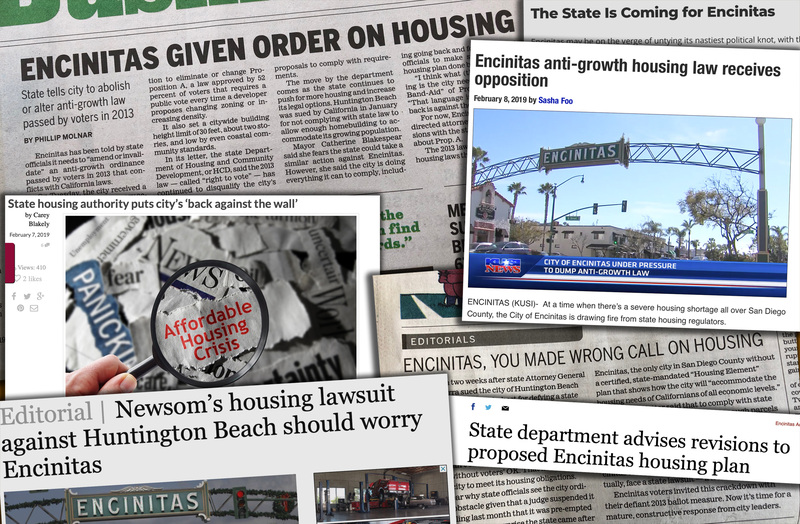 A sample of the news coverage and editorials regarding Encinitas’ intensifying housing dilemma. Proposition A was the Encinitas voter initiative passed in 2013 that took the authority for upzoning away from the elected officials and put it in the hands of the voters. Since then, after both housing plans aiming to comply with state housing laws were vetoed by voters, the state has said that Prop. A’s voter requirement needed to be removed. The intention of Proposition A needs to be preserved where ever feasible, while recognizing the reality and imperative of what the state and the court require. One silver lining is that it seems clear that the vote-requirement in Prop. A can remain for proposed upzoning that is discretionary (i.e. not required to meet state housing laws). One of the first actions from our newly elected Governor Newsom was to come our strong against cities that aren’t doing their part to build housing. In what is clearly a warning to other cities, the state announced that it’s suing the city of Huntington Beach for not complying with state housing laws. This action intensifies the sobering reality of what’s at stake. Here’s the Los Angeles Times article about the Huntington Beach lawsuit, emphasizing the new governor’s warning to other cities. There are a large number of media stories this week about Encinitas’ specific predicament, from the Coast News, the Encinitas Advocate, the San Diego Union-Tribune, Voice of San Diego (at the end of the article), and KUSI News. Building better county transportation in Washington, D.C. I recently traveled to Washington D.C. for multiple governmental purposes. 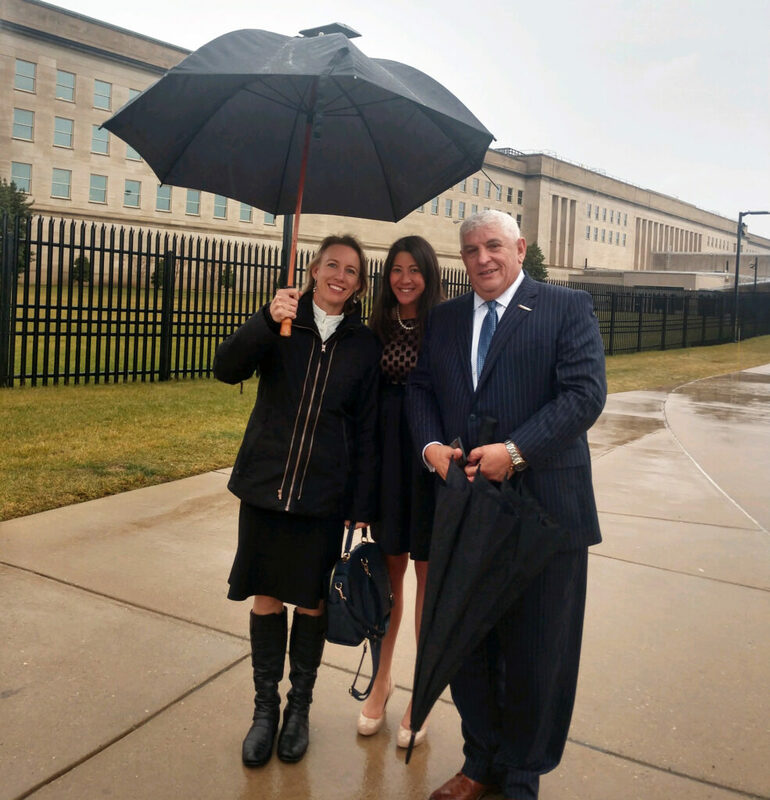 Pictured above, I’m standing with SANDAG’s energetic and supremely capable new executive director Hasan Ikhrata and the agency’s outstanding legislative analyst Victoria Stackwick in front of the Pentagon before meetings with high-level members of the Navy.As a recently elected leader at SANDAG, the county’s transportation agency, it’s an exciting challenge for me to participate in the broader efforts to improve how our region’s residents get around the county. I can’t overstate the positive influence of SANDAG’s newly hired executive director Hasan Ikhrata. In just his first few months, he has established an ambitious agenda and is working with the board to chart a new course for the future. We’ve begun re-conceiving how our network of roads, mass transit, active transportation and technological innovation could work to create more options for residents, and reduce the amount of carbon generated from our transportation choices. These conversations were not happening to this degree before his arrival at the agency – it’s inspiring to work alongside him. One piece of a new transportation puzzle is to create a mutually beneficial project with the Navy on a piece of property they own near the airport, called “SPAWAR.” The project could provide mixed-use development, office space and housing, plus a “grand central station” for transit that would take people directly to the airport from anywhere in the county through a “people mover” – either an above-ground tram or an underground tunnel. A number of other ideas will be forthcoming soon as the county embarks in a new direction on the regional planning effort that needs to demonstrate a 19% reduction in greenhouse gas emissions per capita by 2035. 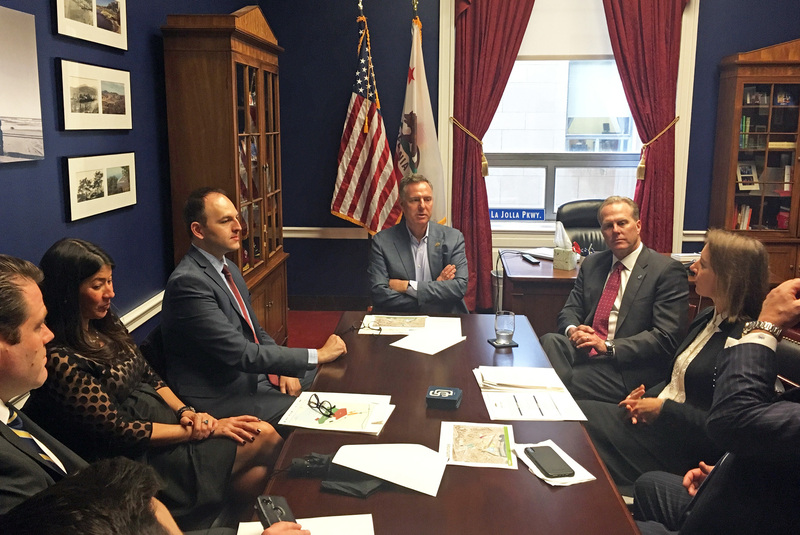 Pictured above in the center seat is U.S. Representative Scott Peters, in his D.C. office. On his left is Mayor Kevin Faulconer and me, with government staff on his right. We also had dinner with Encinitas’ newest congressman Rep. Mike Levin, and met with others in the congressional delegation, plus I attended a number of sessions from the U.S. Conference of Mayors. After the U.S. Conference of Mayors, I was invited to present this summer at their annual conference about Encinitas new innovative “permit-ready” accessory dwelling unit program. By the way, this brand new program is off-the-chart popular with Encinitas residents – 500 sets of printed plans were snapped up like hotcakes at two extremely popular community meetings. At the first meeting, staff stopped counting at 260 people and had to turn people away! Hereis a recent Coast News article about the “permit ready” program, and you might enjoy visiting this link to the actual plans, where you can easily choose the size of accessory unit you want, from a studio to a 3-bedroom. The government doesn’t want asylum seekers to become public charges, so they need to have family members who will help them while they await court hearings on their asylum claims. 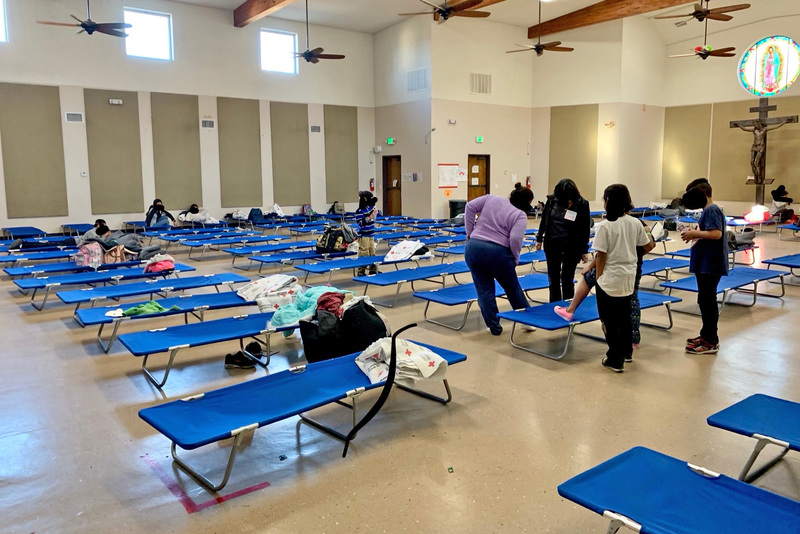 The majority of these families are only in San Diego for a day or two before they travel across the country to be with their sponsors – then their asylum claims are heard near those locations. 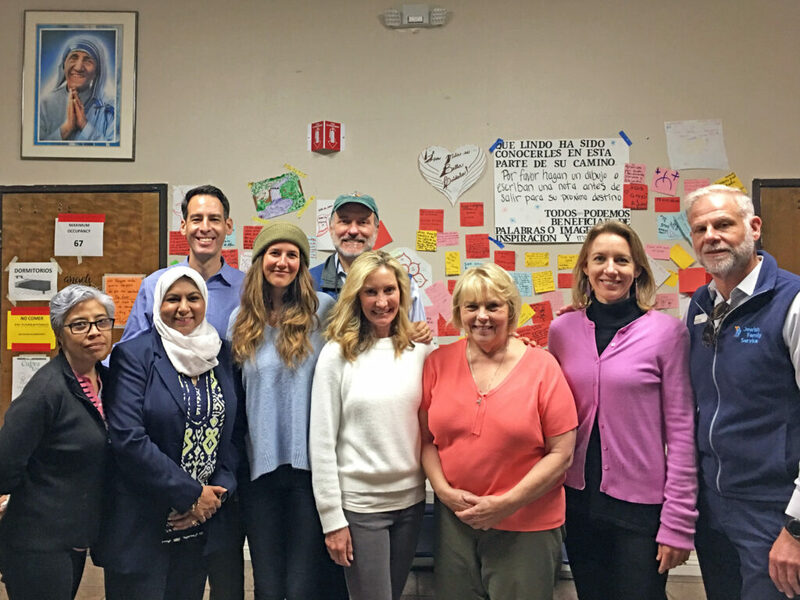 The work being done at the local shelter by Jewish Family Service, as part of the San Diego Rapid Response Network, to help these vulnerable people is remarkable. At a time when the migrants literally have nothing but the clothes on their backs, they are provided meals, showers, a bed (see above photo from the inside of the church-turned-temporary shelter), shoes, warm jackets for those headed to cold climates, and help in getting bus tickets. Many of the asylum seekers speak no English. The shelter has assisted nearly 6,000 asylum seekers legally in this country since October. When you consider that our county has about 9,500 homeless people, it’s not a stretch to consider the dire consequences if even a small percentage of these folks ended up on our streets. Another serious risk to the vulnerable moms and children is that they may become trafficked, victimized by someone offering to help them, starting with a stay in a hotel room and the offer of money. I organized this tour because I wanted to better understand the phenomenon of mass migration affecting our border region right now. We all experience its humanitarian effects. I feel a moral responsibility to know what is happening and to help where possible. I invited other elected officials because I thought they might feel similarly motivated. While the asylum-seekers’ needs are great and many, we’ve been told that the single biggest way to help the effort is to contribute money. Donations of food and clothes are sometimes difficult to process, and it’s apparently common for donated clothes to be substantially too big. Most of the men are small and extra small, with many adults fitting better in clothes that are child-sized. If you can donate to help provide a modest transition for these people seeking a better life, please do that here. Also, you’re invited to a community town hall meeting and call to action about how we can support asylum-seeking families. It’s at 6:30 p.m. this Tuesday evening, February 12, presented by Neighbors In Action at Ocean Knoll Elementary School, 910 Melba Road. I’ll be offering the welcoming remarks. Have a great week, and I’ll be writing to you again next Sunday! P.S. I hope everyone has enjoyed our recent spate of generously wet weather, and appreciated that it doesn’t get too cold here in coastal SoCal (although a couple of days last week were pretty frigid!). 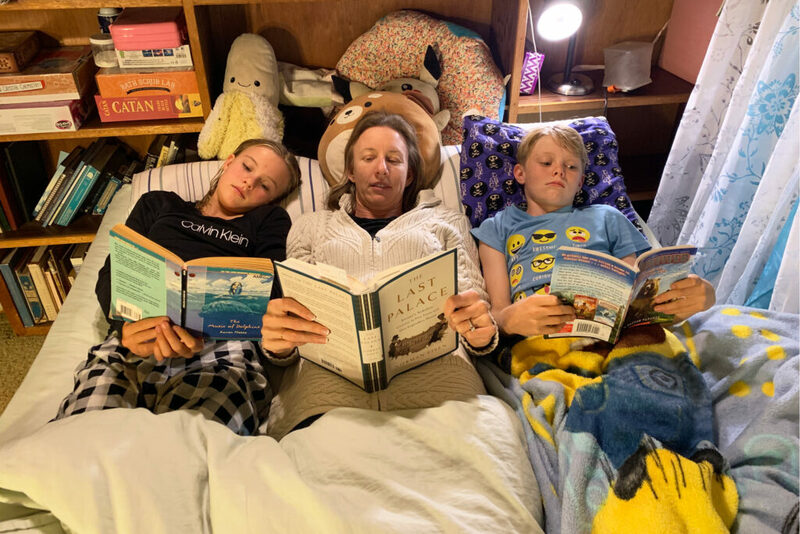 Taking advantage of a rainy day, the Blakespear family enjoyed some shared reading time.